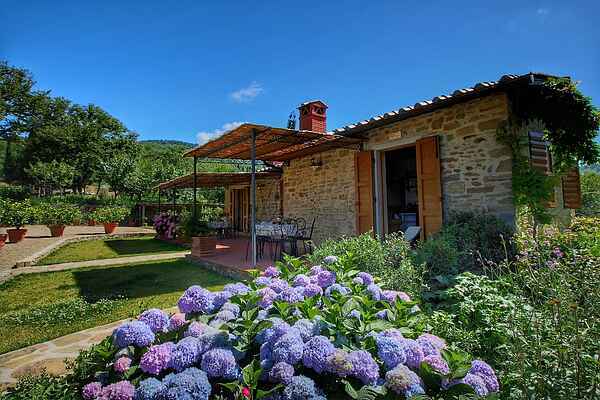 This holiday house lies in the middle of the hills of the Valdarno Arentino at 600 metres altitude and offers her habitants a breath taking view at the Tuscan valleys. Villa Clemacine is situated on the estate of an Agriturismo, which had been entirely restored in its original state while preserving the authentic elements and is surrounded by vineyards, olive and fruit orchards. The villa is modern furnished and meets all demands for a luxurious comfort. The Agriturismo lies on an estate of approx. 40 ha. of forest, which is part of a nature reserve which shelters hares, squirrels, pheasants and other animal species you might encounter during your walks. You have a communal outdoor swimming pool at your disposal which offers a breath taking view at Pieve di Gropina. A recommendation for the romantic people among us who love to experience a sun set from the swimming pool! Besides the complex is an old little church which was used as a meeting point for the regional farmers in the old days. The Agriturismo also cultivates white- and red wine Chianti (D.O.C.G.) and olive oil. Due to the favourable location, well known cities such as Florence, Arezzo and Siena are ease to reach. Specifics: Originally this villa was divided into two separate holiday houses. That explains the two bathrooms and the two kitchens. Furthermore there is a communal washing area in the basement (with its own entrance) where the agriturismo guests can use the washing machine.